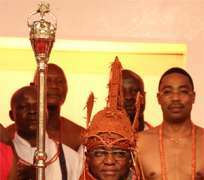 Hails the coronation of the new Oba of Benin Kingdom, Omo N'Oba N'Edo Uku Akpolopkolo, Oba Ewuare 11. The President of the Nigerian Community in The Netherlands (NNA-NL), Chief Mrs Evelyn Azih felicitates with all the Edo Sons and Daughters residing in The Netherlands on the coronation of the new Oba of Benin Kingdom, Omo N'Oba N'Edo Uku Akpolopkolo, Oba Ewuare 11. In the goodwill message she sent to the Chairman of Edo Union in The Netherlands, Mr. Rodney Irene, she urged all the Edo indigenes residing in the Netherlands to be peace löving and law abiding citizens and to always showcase Benin customs and traditions in The Netherlands. She advised them to emulate His Royal Highness Eheneden Erediauwa who is a symbol of Benin cultural heritage and wished the new OBA a successful reign.